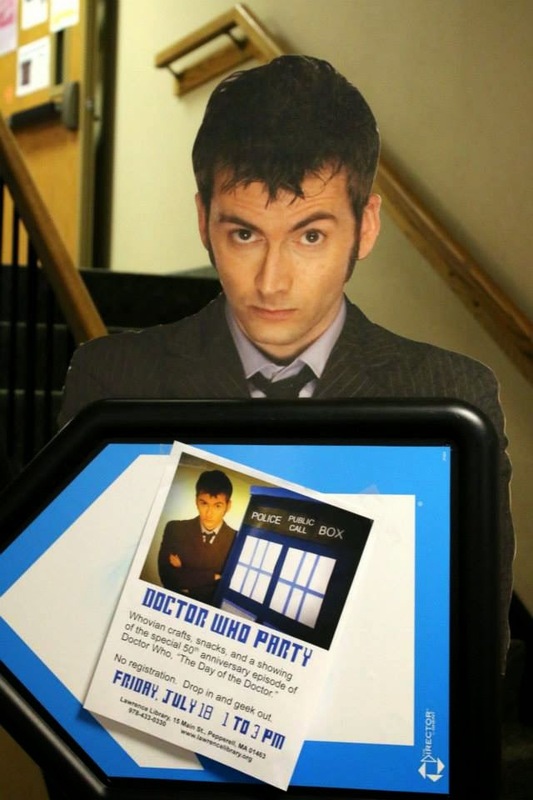 David Tennant always leads the way. Firstly, I think it was very helpful that, between the last event and this one, I managed to get myself completely hooked on this show, so I understood the fandom and was better able to serve my fellow geeks. The first time I did a DW event, I vastly under-estimated the amount of people who would be interested. I made a cake (decorated with a Cyberman head), which was gone by noon, and ended up sending someone for more popcorn; all-told, we went through 13 bags of microwave popcorn, countless pitchers of lemonade, and everyone was still clamoring for food at the end. And I was tired and grouchy and overwhelmed. This time, I planned ahead. We had themed snacks: jelly babies (gummy bears), TARDIS lemonade (it was blue), Adipose cookies, and fish fingers with custard (vanilla pudding and gummy fish). It was a huge hit. We still ran out, but we didn't run out until the very end, and everyone was happy and really enjoyed the snacks. little blobs of fat with faces. 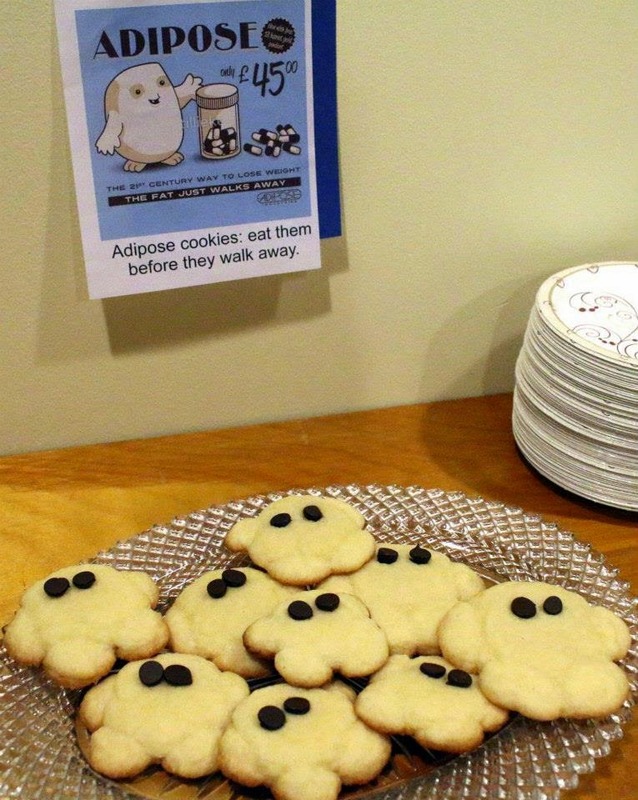 I added the chocolate chip eyes after I took them out of the oven, but I'm not sure it matters. I also made witty little signs for each of the snacks. We also had two crafts. We decorated TARDIS keys. The husband of one of my coworkers works for a car dealership, and he gave us a box of old key blanks that were no longer in use, and we decorated them with glitter (to make them look more space-like, or something). That was easy and fun. We also made bow-ties for shirts or hair bows, which I detailed in a previous post, and we had (like last time) our stand-up TARDIS made out of a folding partition. We got permission to make it into a permanent TARDIS, so I attacked it with the hot glue gun, lots of felt, and a little bit of paint. I'm not sure I didn't like the paper one better, but at least we don't have to assemble it every time now. Why erase a beautiful thing? 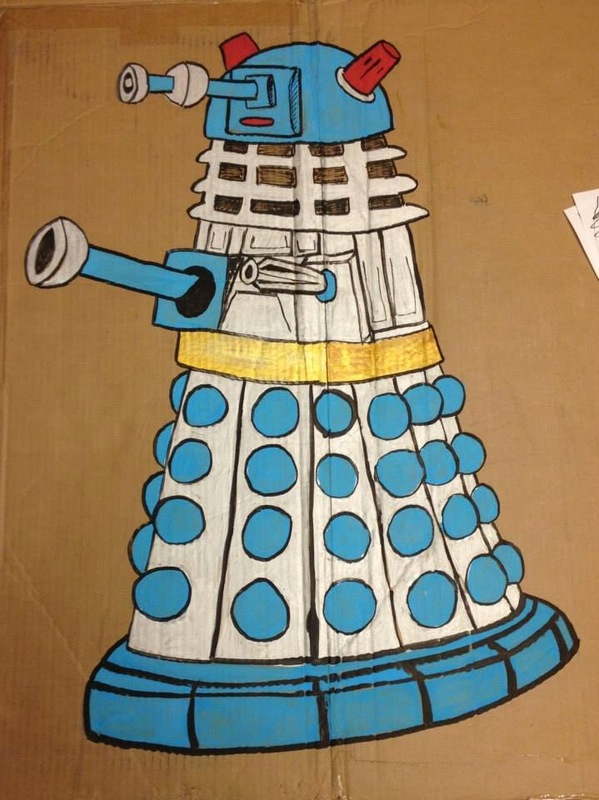 and I made a cardboard Dalek. Originally, it was supposed to be a standee that you can put your face through and take a photo, but I liked it too much to cut a hole in it, so we just let him be a decoration and scare people who dared to turn the corner. The episode we watched was "The Day of the Doctor," which was the special 50th anniversary episode of the show, for those not in the know. (I know... 50 years! I have so much catching up to do!) I had expected that some people would watch while others ate snacks and/or did crafts, but I was wrong. Everyone - to a person - sat and watched the show, and then ate snacks and did crafts. Apparently it was too awesome of an episode to distract yourself from. OH! We also had "pin the face on Lady Cassandra." 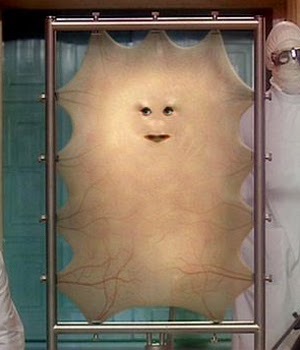 In the show, Lady Cassandra is the last human alive, but she's had so much plastic surgery that she ends up looking like a flat piece of pizza dough with a face. I made that shape out of paper and taped it to the wall, then made a bunch of faces that could be stuck on. For some baffling reason, I don't have a photo of that. I'm sure you can figure it out. I had also intended to write out "Bad Wolf" on the floor with tape, but I forgot until it was too late. All in all, it was an amazing program, and a fantastic day. Lots of prep work, but totally worth it. People came in costume - bow ties, TARDIS hats and dresses and messenger bags, long colorful scarves... No weeping angels this time, though. Would I do it again? Yes, in a heartbeat. Maybe not with Lady Cassandra this time, unless she was just up for decoration. Honestly, though: I used to be ashamed to be a geek, and I would hide it when I'd get excited about all the weird stuff (that is: not girly, not cool, not socially acceptable... like sci-fi and fantasy books, and Star Trek, and historical fiction, and musical theater) that I liked. But not anymore! I embrace it, and celebrate it, and I am not alone! There are lots of us... and we have awesome parties.